Kirifuri Highland (霧降高原) is the highland located northern Nikko, Tochigi. There are many hiking courses, camping place, sky resort and golf courses. It is located over 1500m high from the sea levels, and has beautiful natures including Kirifuri Falls, which is one of the 100 best waterfalls in Japan. 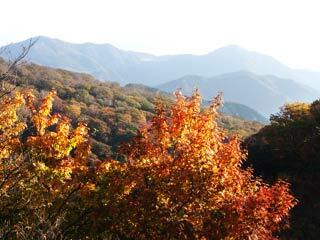 In fall, the autumn leaves are beautiful and many photographers and hikers visit. There are parking and restroom at the entrance of hiking courses. Kirifuri Highland is a famous for its Tsutsuji flowers and Kisuge, Daylily. You can enjoy various kinds of flowers from April to October, and it finishes with beautiful Koyo, Autumn leaves. In April 1868, when Otori Keisuke and his 2,000 of Tokugawa armies escaped from Nikko to this valley, he found out beautiful Yashio Tsutsuji flower, and he wrote song. "We are at deep side of mountain without homes, and now it's sunset. Use stones for pillows, and our three companies sleep on the sand. Just before the sunrise, a voice of a bird echos over the valley. There are beautiful flowers over the white snow."